John Romero recently posted an article in which he discussed the strength of Tidiness Theory in game design, the human desire to build, and the potential ramifications these behaviors in games have for evolution. While I think his closing paragraph is rather misinformed (evolution just don’t work that way), the rest of his article paints a good outline of how Tidiness Theory rears its head across multiple genres. I find I both agree and disagree with Romero’s assessment that Tidiness Theory is why players continue to play certain games. So, this is not what I usually write about. But I was given some really great news and I thought I should share it with the rest of you. 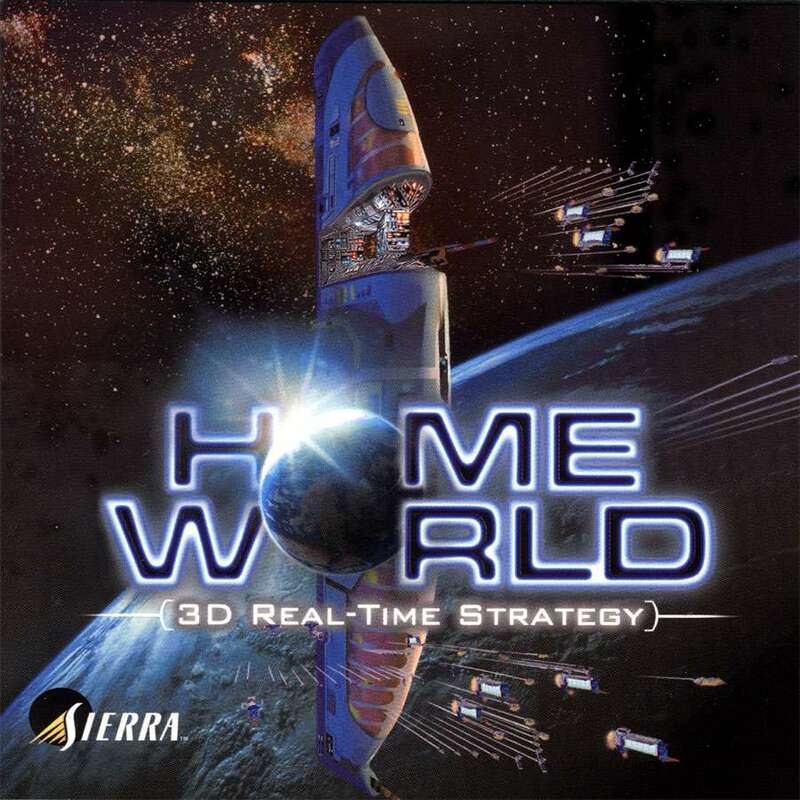 You know how Gearbox acquired the rights to that totally sweet game Homeworld? I know, I know, it came out in 1999 which is practically forever ago, but it was still pretty incredible… rather than review it right now, I’ll just say that I loved playing that game, loved watching that game, and loved listening to that game. Anyway, Gearbox just signed a deal to allow Blackbird, a company founded in part by people involved in making the original Homeworld, to publish their new game Hardware: Shipbreakers as a part of the Homeworld universe. Quick disclaimer: I received my copy of the first issue as a review submission, and am friends with Lucy Bellwood, one of the excellent artists on the project. Cartozia Tales is the collaborative creation of a group of indy cartoonists, with two issues out and another eight to come pending a successful Kickstarter project. 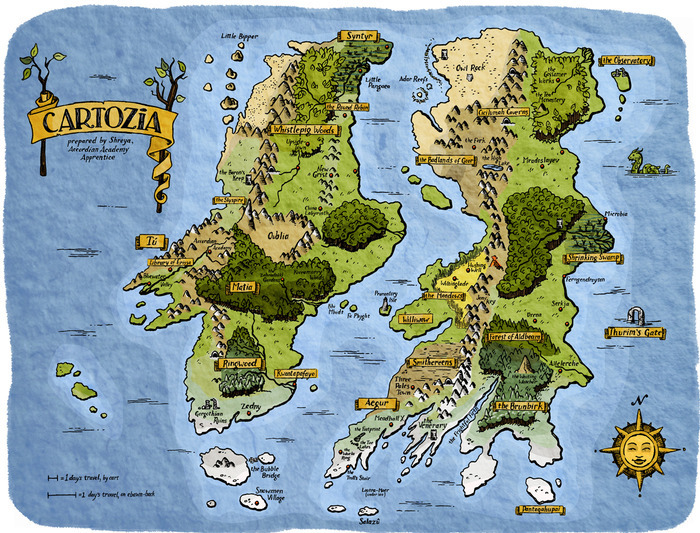 It explores the world of Cartozia by offering stories from all over the map… literally. One of the central conceits of the project is that each of the artist teams will create stories from a randomly chosen location in the world of Cartozia, with the eventual goal of having every artist tell a story from every section of the world. The world itself is filled out in promising detail on a map in the center of the first issue (like that pretty one up above). Your initial introduction to the material is offered by a young cartographer named Shreya, who travels around the world of Cartozia mapping it out and collecting stories. These stories are all designed to be accessible to young readers, and as such they are short, move quickly, and don’t require an extensive background vocabulary. But leaving it at that doesn’t do full justice to the content; a number of the stories were just as deep and engaging as I would hope something aimed at an older audience to be, and the stories that didn’t quite hit that note felt like they promised to do so within the next few episodes. The art changes from one story to the next as different artists take the reins, offering a wide variety of styles in a medium that is more often denoted by much larger uniform chunks. I am of course quite partial to Lucy’s work, but I found several new artists that I expect to look up once I’ve finished writing this post (never mind, I couldn’t resist and already looked them up). Simply put, I quite like this project and I’m looking forward to reading the next issue. I highly recommend that you check it out, and contribute to their Kickstarter if you like what you see. I live in Portland, and as such, everybody I know is a ‘writer’. I imagine it’s like being an ‘actor’ in Los Angeles; people use the word as a catch-all for their hopes and dreams. But wanting to write and doing it occasionally doesn’t make you a writer any more than playing pick-up basketball every once in awhile makes you a basketball player, or playing with Legos makes you an engineer. And so most ‘writers’ I know are actually baristas, with most ‘actors’ being waiters/waitresses. Maybe I should put a number on that title. I expect I’ll be writing more posts like this in the course of writing this blog. Much like Mattias’ post, this one is meant to keep you up to date. First, some housekeeping notes: I’ve set up additional pages such that you can more easily find my creative content simply by mousing over the Our Fiction tab. My choose-your-own-adventure is still hidden a little deeper in there, so you’ll have to click on the tab itself in order to find it (I should probably fix that too, just to make my other work more accessible, no?). Also similar to Mattias’ note, I’ve got news on more adventures for Jerome! My Jerome, not his. I’m afraid there was some cross-pollination after Mattias briefly used the name “Jerome” for all of his RPG characters. Now we’ve both got main characters named Jerome in our stories, which certainly doesn’t help you, our readers. Just remember that my Jerome lives in a world of fantastical alternate history, while Mattias’ Jerome lives in a straight up fantasy world. Anyway, the news is this: I expect that there will be another short story installment in the next two weeks. I’ll post it when it’s mostly done, but let’s call it September 9th just to be sure. When it comes to my writing, I’m not so good at putting things out there. Why? Because I want it to be perfect. I’ll edit things forever and still not be satisfied, so when I do release something, it’s still in ‘rough draft’ phase because everything I’ve changed now needs editing. So I thought I’d try an experiment, and start releasing scenes without editing. This is the start of a short story series I’m writing in a steampunk/noir setting. It got written in about an hour, and basically wasn’t edited, so it’s rough around the edges, but I like the tone of it, I think. I hope you enjoy it! 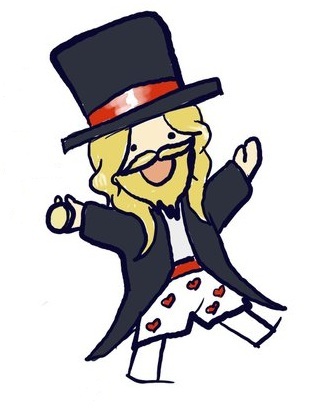 Also, enjoy a cameo character! A second chapter will be going up this Sunday; I need a little bit more time for edits. If the chapter is not done to a degree I consider satisfactory, I will just post those scenes ready for public consumption. In the future, my schedule will be as follows: an analytic/theoretical post on Tuesdays and a creative content post between Thursday and Sunday. This will either be a short story or as much of a chapter as I can muster. Given that I write 6+ articles for varying websites every week, I don’t know how long I can churn out creative content, so wish me luck! In the meantime, here is the first scene from Chapter 2 of book 1 of The Steam Wars; view the updated Prologue and Chapter 1 on The Steam Wars page. Jim Rossignol of Rock Paper Shotgun also runs a game company, called Big Robot. For one month last year, Big Robot ran a kickstarter project to fund their game Sir, You Are Being Hunted (now available both directly from Big Robot and through Steam). I backed that project. This summer, just a few days ago in fact, Big Robot released an alpha of their game to their backers. Can you see where I’m going with this? Good. What follows is a collection of my first impressions of Sir, You Are Being Hunted, a game about traipsing across faux-British countryside in search of important MacGuffins while being mercilessly pursued by a very large number of robots with guns. Games are a broad category, something immediately apparent from any attempt to define them. When I was younger, I used to criticize sports like golf and running for ‘not being real sports’. My critique? You were competing against somebody only inasmuch as you were being compared to them. To use mild jargon, there is no way to interfere with your opponents. Now, of course, I know better, but it leads me to the thought of the number of different types of competition you can have in a game, and how that sets the tone.